Red Bull took to Out of Home (OOH) this month to promote its Racing Showrun Event which took place on 3rd November at Belfast City Hall. The event showcased performances from Irish motoring royalty and 13-time Grand Prix Winner David Coulthard in a magical RB8. To amplify anticipation in the lead up to the event, a combination of classic OOH formats were employed, along with a live digital countdown timer that ran on Clear Channel’s Adshel Live. The digital countdown timer was delivered using PML’s proprietary Dynamic platform. 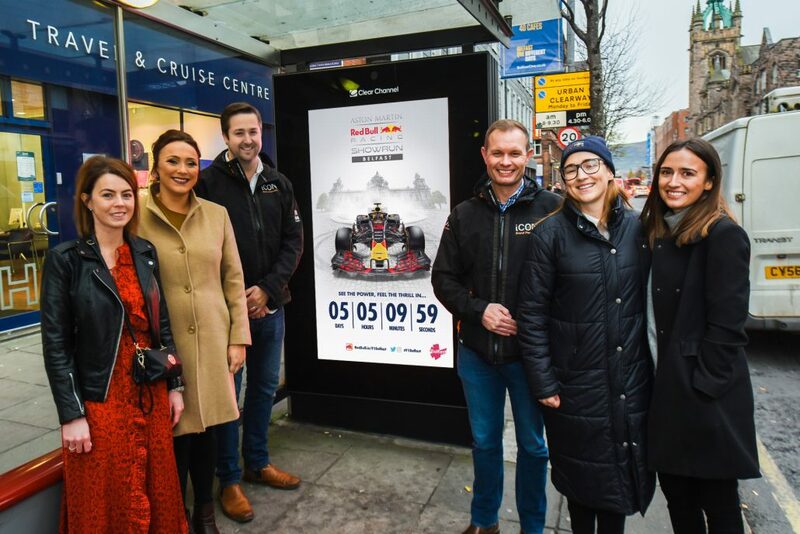 Speaking about the campaign, Mary-Anne Byrne, Red Bull Brand & Culture Brand Manager at Richmond Marketing said; “The Adshel Live really allowed us to bring to life the ferocity of the Red Bull Racing F1 Belfast creative. The countdown timer helped build excitement and marked the event as a must-see, resulting in over thirty thousand people attending. This was the perfect advertising format for this event”. Eileen Murphy, Client Manager at Zenith added; “We are delighted with the end product – this is the result of collaboration between lots of parties. The Dynamic live countdown looks great and really helps to build buzz around the event”. Clare Ferris, Account Executive at PML said; “It has been a pleasure to work with all parties involved in the Red Bull campaign. From chatting about this event coming to Belfast at the beginning of the year, to seeing it out on the street has been great. I had a very clear vision of what I wanted to achieve for them from the offset and with the inclusion of the dynamic countdown timer on Adshel Live; this enabled us to create a real positive atmosphere”.